The latest monthly report is out on progress on the big Public Safety Building project. This time around, the only “issue” to report was misconceptions about the flag hung on the building. it has been brought to Vertex’s attention that some community members are wondering why the flag that has been hung on the building is “faded”. The flag that was selected and hung is a 9/11 memorial flag. It differs from the typical American flag because the red, instead of being solid, is actually the names of the fallen from that day. This flag will be taken down and displayed in the building. I don’t have an original photo, but the committee Chair shared an example with me. (You can click on the thumbnail right for a better view.) 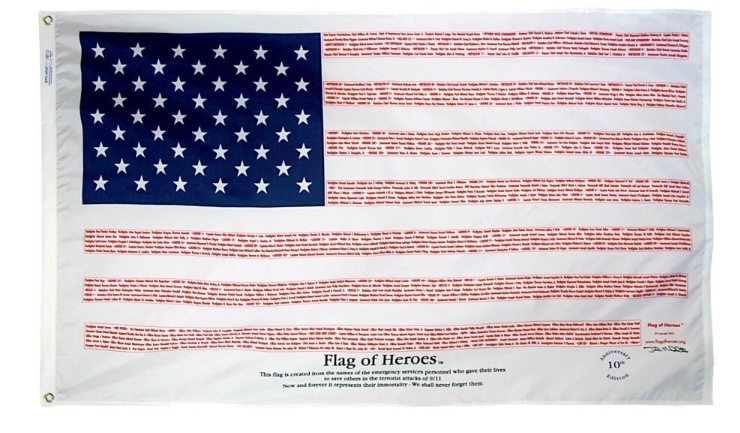 The “Flag of Heroes” lists the names of emergency personnel who lost their lives that day trying to save others. You may recall that earlier this fall, the general contractor asked for more time. The Town pushed back and eventually settled on allowing an extra unpaid 10 days. The newsletter again shares a load of details on construction activity, average daily work hours, change orders and more. 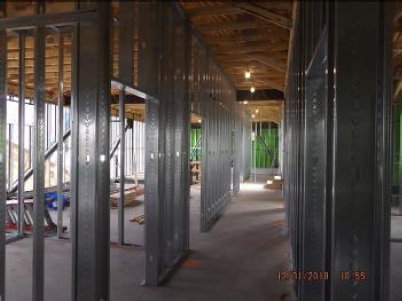 It also features photos on various aspects of the project – like the framing of the second floor interior. You can see all of that by clicking here. Those of you more concerned about the land surrounding the building can read my post from earlier this week on the Golf Course status. Speaking of the Golf Course, it seems some commenters have been including part of that project’s cost when referring to the building in comments. Part of the original Article was for the land deal to acquire and preserve St. Mark’s Golf Course. The building project was approved for $22.6M. That included a contingency and the committee appears to be on track for shaving millions from that. *Again, the newsletter is status as of the end of December. So, those issues may have been resolved since. A 42-year-old man walks into a Recreational Vehicle dealership. He is thinking ownership of an RV would be a great way to spend his vacation time with his wife and two children. After looking at a couple of the vehicles on the lot, he flags down a salesman to get some of his questions answered. When the discussion with salesman gets to the cost of the RV he is interested in, the man proudly tells the salesman he will make his last car payment of $ 254.00 in two months. The salesman goes through the process of determining the monthly payment cost for the recreational vehicle in question and tells the man purchasing the RV will only add $137.00 to his monthly payments. The man considers this a good deal and purchases the RV. What does this have to do with the new Safety building? If you look back at the information provided at Town Meeting, you will see a nearly identical approach. This rationalization is outlined in a Mysouthborough article published just before the meeting. (http://www.mysouthborough.com/2017/03/07/letter-public-safety-study-committee-part-2-project-details/). Scroll to the bottom of the article to see the cost analysis. It has now been 18 months since our new RV owner took ownership of his vehicle. His car is now 7 years old, has over 100,000 miles, and should be replaced. In order to replace the car, he is considering cutting back on this year’s vacation plans. Interesting that we were sold on a $137 tax increase but we are seeing a $300 one instead.